Wildfire smoke is full of small particles that can get into your eyes and lungs causing health problems including chest pain, headaches, or an irregular heartbeat. The Washington Department of Health encourages people to stay inside and away from pollution when air quality levels become unhealthy. Keeping your windows and doors closed and using an indoor high-efficiency HEPA filter can help keep indoor air as clean as possible. High-end filters can be expensive if you don’t already have one in your home, but the good news is you can make one for a fraction of the cost in just a few easy steps. All you need to do is buy what’s called a MERV 13 or FPR 10 furnace filter and tape it to the back of a box fan. The filters sell for about $15. Don’t worry if you don’t have any tape because the suction from the fan should make the filter stick to the back. “The tape is just helpful to keep it tidy so when you shut off your fan the filter doesn’t just flop off,” Erik Saganic, air resources specialist for Puget Sound Clean Air Agency, said. 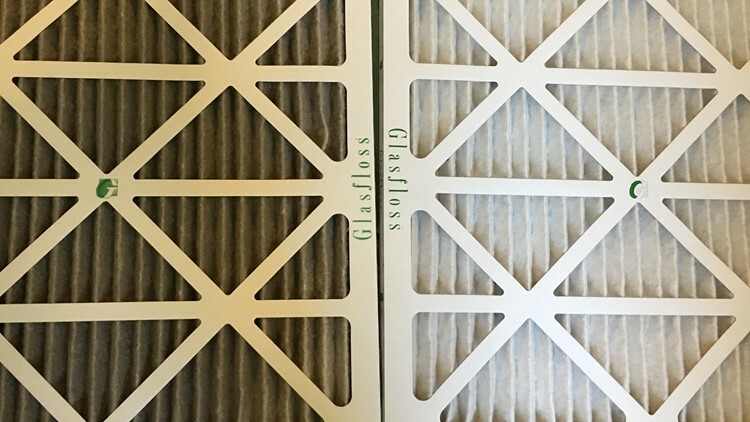 Saganic said it’s OK to have gaps around the filter and it doesn’t need to be a perfect seal. Last year the Puget Sound Clean Air Agency put one of the homemade filters in a 14’ by 14’ room with all the windows and doors closed. The filter dramatically decreased the amount of black carbon in the room within 30 minutes. The agency says the filter can give you a 90 percent improvement in fine particles. 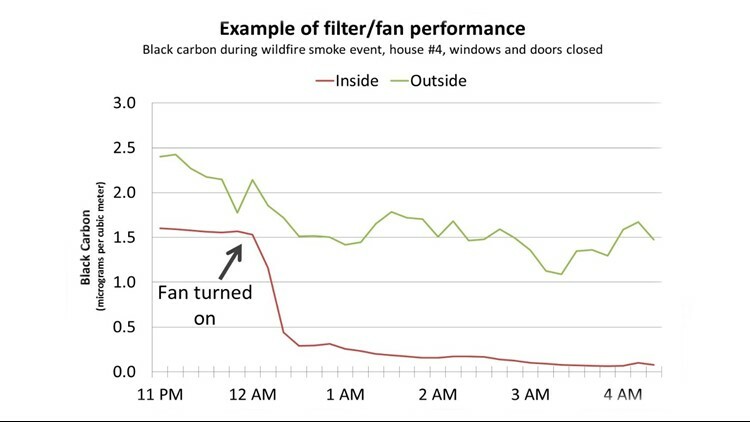 This graph from Puget Sound Clean Air Agency shows the reduction of black carbon in a 14' X 14' room after turning on a homemade air filter. Air filters should be used in your bedroom or in the room where you spend the most of your time. Watch the video below or click here for step-by-step instructions. Click here for more ways to protect yourself from wildfire smoke.